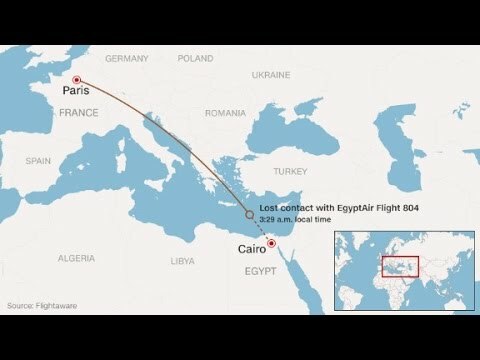 EgyptAir said the plane’s emergency devices sent a distress signal at 4.26 a.m. local time, about two hours after the previously stated radar contact. A senior U.S. Intelligence official familiar with the U.S.’s capabilities in the region told NBC News that infrared and multi-spectral imagers strongly suggest there was an explosion aboard EgyptAir plane, which went missing over the southern Mediterranean earlier Thursday. However, he stressed that the cause of the crash remains unknown. Meanhwile, the wreckage of the EgyptAir plane has been found near the Greek Karpathos Island, the airliner said in a statement.
. . . EgyptAir said in a statement Thursday afternoon . . .
“EgyptAir sincerely conveys its deepest sorrow to the families and friends of the passengers onboard Flight MS804. Family members of passengers and crew have been already informed and we extend our deepest sympathies to those affected. The statement added that an Egyptian Investigation Team in co-operation with a Greek counterpart are still searching for . . . remains of the missing plane.